There have been positive changes in people’s view of online shopping in recent years. Customers tend towards online shopping instead of traditional retailing even in important discount periods such as “Black Friday” which have been performed in foreign countries for a long time. Here you will read the mobile apps effect on e-commerce. What is the impact of mobile apps in e-commerce businesses? Online shopping has reshaped people’s shopping habits indeed, however, e-commerce has continuously been changing in itself. Especially with the increase in the use of mobile devices such as smartphones and tablets, e-commerce sales tend towards mobile devices. Mobile apps are greatly affecting shopping habits, inevitably. So, at which points and to what degree mobile apps play role in e-commerce? Why consumers prefer mobile apps? According to the studies, users mostly prefer mobile apps in e-commerce when it is compared to the websites. There are a lot of reasons for that, for example; users can easily pay for anything via their smartphones which they can personalize as they want. Making payment with innovations such as the digital wallet or virtual POS make things easy for users. Moreover, one can do shopping via mobile apps without depending on the environment, so customers decide to purchase whenever and wherever they want. With all these justifications and more, it is possible to say that mobile apps are one of the important factors which have an effect on the way of e-commerce. 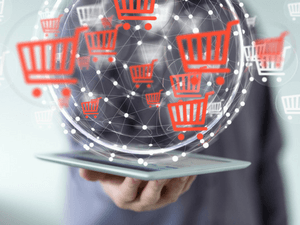 What e-commerce companies can do? Companies doing e-commerce on websites are the ones most affected by this process. E-commerce companies that haven’t stepped into the mobile world yet can make their websites responsive to the devices. Thus, optimizing online stores into different devices, screen sizes or browsers with a suitable design can be a long term commerce solution. However, it is helpful to create an app to be at the fingertips of the users and having the advantages of owning a mobile app. If you still do not have a mobile app, don’t worry. Create your MobiRoller account and have the chance of having your own mobile app in a few minutes without needing any code information.